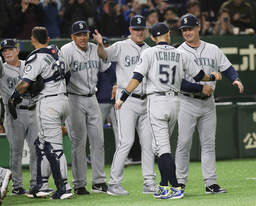 TOKYO (AP) ��� Ichiro Suzuki drew the loudest ovation back home in Japan and Domingo Santana delivered the biggest hit, launching a grand slam that led the Seattle Mariners over the Oakland Athletics 9-7 Wednesday in the Major League Baseball opener. 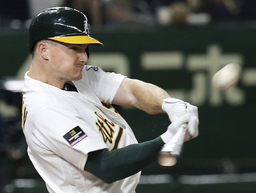 The game at the Tokyo Dome marked the earliest opening day ever - the summer sport actually started on the last day of winter. No doubt, most fans in North America were sound asleep when Oakland's Mike Fiers threw the first pitch at 5:36 a.m. EDT (6:36 p.m. local). 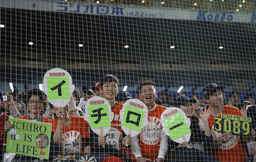 Ichiro is expected to play again Thursday when the two-game series finishes, and that might be the end of a sensational pro career that began in Japan in 1992 when he was at 18. 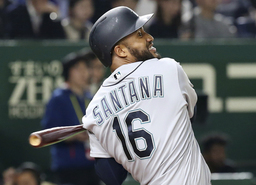 He stopped playing last May to become a Mariners special assistant - after totaling 4,367 hits on both sides of the ocean - and struggled in spring training this year. Beckham got three hits and three times. Also making a nice debut for Seattle were Jay Bruce, who singled for MLB's first hit of the season, and Edwin Encarnacion, who scored twice.